One reason I’m intrigued by Jaynes’s idea is that it’s simply hard to explain the centrality of religion to ancient societies without recourse to something more than simple “cognitive errors.” After all, religion is costly. Think of all the time and energy that went into worshiping–whether it is elaborate rituals, lavish burials with grave goods, tombs, barrows and tumuli, sacrifices of both people and animals, dances and festivals, elaborate paintings and sculpture, and, of course, temples. Why didn’t atheistic societies take over societies that wasted huge amounts of resources in this way? The conventional wisdom is that religion was necessary for group cohesion in the days before bureaucracy, written documents, centralized government, and related institutions. But something about that seems inadequate to me. 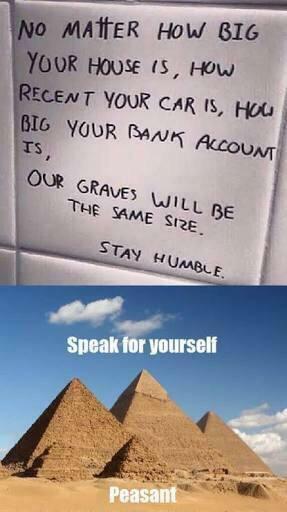 Does one need to build pyramids to have a cohesive society? 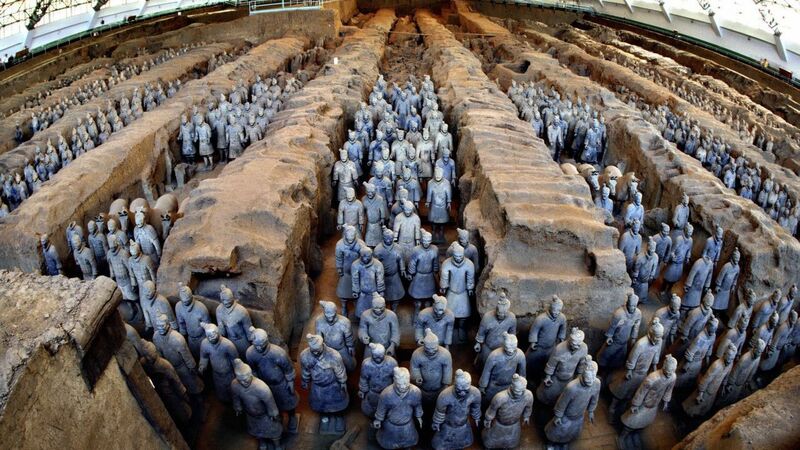 Does one need to bury their ruler with hundreds of terracotta warriors? Think of all the fantastic works of art, sculpture, and craftsmanship that were made simply to be sealed up in the tombs of Egypt and elsewhere. Think of all the craftsmanship that went into something like Tutankhamen’s death mask, for example. Even as far back as 34,000 years ago, people were burying some of their most labor-intensive goods in the ground. Another school of thought has it down as just a massive case of collective denial. While denial is not just a river in Egypt, it is near that river that we see some of it’s most impressive manifestations. The idea is that by building structures that last longer than we do, we transcend death–that is, we conquer, in some sense, our own mortality. But why does everyone else go along with this? Were the workers just as motivated to deny their own death by working on the pyramids, despite no one knowing who they were? Why not put all that effort into making real warriors and stone fortifications and take over one’s more superstitious neighbors bowing down to graven idols? Why not trade your highest quality stuff in markets instead of burying it or sealing it up forever in some tomb? And that’s before we consider all the other strange behaviors. I’ve previously mentioned trepanation. From my (albeit limited) research, the two types of people who poke holes in their heads in modern times are these: voice hearers and LSD trippers. And what’s up with all the sacrifices? When you start studying this stuff in depth, you realize that pretty much everything flowed from primitive religion in some way: politics, laws, marriage customs, inheritance, economic relationships, business partnerships, child-rearing, the status of women, family structures, and so on. Essentially, all laws and politics stemmed from religion. Huge amounts of social effort went into appeasing the gods. That’s one hell of a cognitive error! A comparison of beliefs and laws shows that a primitive religion constituted the Greek and Roman family, established marriage and paternal authority, fixed the order of relationship, and consecrated the right of property, and the right of inheritance. This same religion, after having enlarged and extended the family, formed a still larger association, the city, and reigned in that as it had reigned in the family. From [religion] came all the institutions, as well as all the private law, of the ancients. It was from this that the city received all its principles, its rules, its usages, and its magistracies. But, in the course of time, this ancient religion became modified or effaced, and private law and political institutions were modified with it. Then came a series of revolutions, and social changes regularly followed the development of knowledge. It is of the first importance, therefore, to study the religious ideas of these peoples, and the oldest are the most important for us to know. For the institutions and beliefs which we find at the flourishing periods of Greece and Rome are only the development of those of an earlier age; we must seek the roots of them in the very distant past. The theme of The Ancient City is that ancient classical society was centred in the family in the wide sense of that word— joint family or lineage — and that what held this group of agnates together as a corporation and gave it permanence was the ancestor cult, in which the head of the family acted as priest. In the light of this central idea, and only in the light of it, of the dead being deities of the family, all customs of the period can be understood: marriage regulations and ceremonies, monogamy, prohibition of divorce, interdiction of celibacy, the levirate, adoption, paternal authority, rules of descent, inheritance and succession, laws, property, the systems of nomenclature, the calendar, slavery and clientship, and many other customs. When city states developed, they were in the same structural pattern as had been shaped by religion in these earlier social conditions. What appears to tie all of these together is ritual ancestor worship, also called veneration of the dead, ancestral veneration, or the cult of the dead. An ancestor cult is simply defined as, “The continuing care of the dead under the assumption of their power”. And you see this emerging as religion all larger, complex societies, from the New World to the Classical World to India to China to Indonesia. In China, especially, ancestral veneration was central to religious practice until relatively modern times, existing alongside philosophies like Taoism and Buddhism. In all of these societies, there seems to have been two parallel worships: the ancestor cult and a pantheon of deities who had some kind of power over the natural world. The sheer universality of this phenomenon must have some sort of significance. Why do so many ancient societies worship their dead? Does it have something to do with the fact that, according to scientific surveys, a huge amount of people report hearing, feeling, or even seeing their dead relatives during the grieving process? If you ask, me, there’s been far too little overlap between anthropology and psychology. I’m struck by just how similar Eurasian practices are among cultures that could not have possibly acquired them by cultural diffusion. For example, I was listening to a TS podcast with a Balinese art expert. He pointed out that although Bali is known for Hinduism, what’s lesser-known is that the original religion of Bali was ancestor worship, which is still practiced in villages. In this tradition, families need to pay for elaborate funerary rites, and make continuing offerings to appease the dead spirits. Relatively corporate ancestor-groups are optional in Balinese social structure and are actualized by building a high-level (supra-household) temple, often complemented by making intratemple marriages – for example, father’s-brother’s daughter. As the congregation supporting an ancestor’s temple expands, genealogical connections become obscure: outsiders might even be admitted if costs and upkeep grow burdensome; traditions of an ideal descent line may, however, persist. Yet the social integration of the group rests more on its temple duties per se and marriages between its members. According to high-caste traditions the ideal conveyors of a group’s identity and status are eldest sons of eldest sons, especially if they are born of a marriage with a near patrikinswoman. Emphasis on eldest lines is an optional aspect of Balinese descent. Rules for actual inheritance of house property range from primogeniture to ultimogeniture, and every son assumes particular ceremonial responsibilities for ancestral shrines according to the share of productive fields and other material wealth received after the father’s death. It is in certain textual traditions – the special province of royal houses, but imitated by ascendant commoner groups – that emphasis falls on eldest sons. And eldest sons on the eldest agnatic line who is also the offspring of a patricousin marriage is enhanced in and of his descent; from birth he would be expected to be individually meritorious in keeping with this auspicious genealogy. But occupants of the most highly regarded genealogical positions are not necessarily bearers of the most elaborate legends. Practical leadership of a group often falls to members not automatically qualified by descent. More pragmatic qualities take precedence, and the figures of actual leaders are them apt to be embellished, almost apologetically, with posthumous legends, stories, and anecdotes to show why it was – actual genealogical position notwithstanding – that they succeeded to leadership. It is clearly evident that private property was an institution that the domestic religion had need of. This religion required that both dwellings and burying-places should be separate from each other; living in common was, therefore impossible. The same religion required that the hearth should be fixed to the soil, that the tomb should neither be destroyed nor displaced. Suppress the right of property, and the sacred fire would be without a fixed place, the families would become confounded, and the dead would be abandoned and without worship. By the stationary hearth and the permanent burial-place, the family took possession of the soil; the earth was in some sort imbued and penetrated by the religion of the hearth and of ancestors. 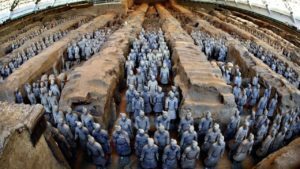 In the religions of latter-day China a very prominent part is played by ancestor worship. Since ancestor worship is wholly alien to Buddhism in its pure form as taught by Buddha, and since it is not included in the teaching (which is more philosophical than religious) of Lao Tzu, the founder of Taoism, its origin has to be sought elsewhere, and recent discoveries have proved that it is far older than any one of the systems which have been engrafted on it and must be accounted as a survival from the earliest days of Chinese civilization. According to that belief a man’s real power began when he died. Death transformed the mortal man into a spirit, possessed of undefined but vast powers where his descendants were concerned. While not quite omniscient or omnipotent, the spirits could grant, or withhold, success in hunting, in agriculture, in war or in anything else, and they could punish those who failed to please them with famine, defeat, sickness or death; so awful were they that it was dangerous even to pronounce the personal names they had borne in life, and they were designated by their relationship and the day on which they were born or died, as “Grandfather Tuesday”, “Elder-brother Saturday”, and so on. To the dead, then offerings had to be made, both at the time of burial and afterwards, so long as the family remained. The dead man, wrapped, apparently, in matting, was laid in the grave with such furniture as his relatives could afford–in the case of the very poor with a few pottery vessels and perhaps a bronze dagger-axe, while an official of high rank might have a profusion of beautifully cast decorated bronze vessels. These were genuine objects, not the crude copies which in later times were specifically manufactured for burial purposes, nor the flimsy paper imitations of still more recent days; the Shang people seem not to have evolved the idea that spirits can be satisfied as much by the ‘ghosts’ of things as by the things themselves; for them the spirits were real and the offerings made to them must be real also. In the case of kings realism was carried to the farthest extent. A pit was dug which might be 60 feet square and over 40 feet deep, with on each side a sloped passage or stairway leading down from ground level. In the pit, and covering the greater part of its area, there was constructed a tomb-chamber of wood finely carved or adorned with designs in polychrome lacquer; in this was laid the body of the king, and in and around it an astonishing wealth of objects, including such things as chariots with their horses, the bodies of attendants, women wearing elaborate head-dresses of turquoise or soldiers with copper helmets; then the pit was filled with earth pounded into a sold mass as was done for house foundations, and in the filling more human victims were also buried, so that the total number might run into two or three hundred. After this elaborate ritual of burial, which bears in details a remarkable resemblance to the Sumerian ritual of the Early Dynastic period and may, like the use of metal, be due to western influences, there was still need for the regularly current sacrifices which furnished nourishment for the dead and won their favourable response to prayer. The spirits of the ancestors dwelt with and were under the rule of Ti, the great god, and they acted as mediators and intercessors between him and their human descendants; prayers to the ancestors take the form of imploring them to ask god to do this or that. This mediation would be forthcoming only if the spirits were satisfied by the proper offerings. The character of these can gathered from bone inscriptions. Drink offerings of spirituous liquor seem to have been the only product of the soil that was presented to the dead, or to the gods; of such things as bread or fruit there is no mention-in fact according to a story of the Chou period, when a high official directed in his will that during the first year after his death his favourite delicacy water-chestnuts, should be sacrificed to him, his strait-laced son decided that filial duty must give way to orthodox tradition and refused to carry out so irregular an order. The normal sacrifices were of men and animals—Cattle, sheep, pigs, dogs, and occasionally horses and birds. The total number of victims sacrificed at a time was usually small, from one to ten; but for an important ceremony might be very large—one hundred cups of liquor, one hundred sheep and three hundred cattle’; and in several inscriptions a hundred and even three hundred human victims are mentioned. The human victims of a tomb sacrifice performed after the actual burial, either as the last act of the ceremony or at a later date, were decapitated and buried in pits, ten to a pit, sometimes with their hands tied behind their backs, furnished each with a uniform outfit of small bronze knives, axe-heads and grinding-stones, and their skulls were buried separately, in small square pits close by. With reference to these victims the bone inscriptions use different words: sometimes ‘men’, sometimes ‘captives’, but most often, and always where large numbers are concerned, ‘Ch’iang’ which, as written, combines the signs for ‘men’ and ‘sheep’ and is said to mean ‘barbarian shepherds of the West’. All sacrifices other than those in the tombs of the kings were celebrated in temples, in ‘the House of the Spirits’. About the ritual very little is known. The liquor was poured out on the ground as a libation; animals, or special parts of the animals, were generally burnt by fire, but sometimes buried in the earth or thrown into water; the last two methods were employed for offerings to human ancestors, which the burnt offerings, according to the oracle bones, were destined for the gods; but how far this distinction really held good it is impossible to say, and it may even be that for the Shang people the distinction was too vague to be consistently observed. …there were gods. Some of these were powers of nature or natural features; one oracle bone records ‘a burnt offering of four cattle to the sources of the Haan river’, the river on which the city Shang stood, perhaps an offering made because of drought such as that of c. 1190 BC when the river ceased to flow. The earth was a deity which later, and probably in Shang times also, was symbolized as an earthen mound (‘the Earth of the region’) piled up in the center of each village; possibly this is the ‘Queen Earth’ of after ages. Mention is made of the ‘Dragon Woman’ and of the ‘Eastern Mother’ and the ‘Western Mother’ and of the ‘Ruler of the [Four?] Quarters’; sacrifices are offered to the east, west and south, and to the wind, the ‘King wind’ and ‘the Wind, the Envoy of Ti’. Ti, or Shangti, ‘The Ruler Above’ seems to have been the chief god. He was specially concerned with war, and the king of Shang would not open a campaign without consulting Di; he was asked about the prospects of the year’s crops, he was one of the powers who could assure the sufficient rain, and generally he could allot good or bad fortune to men. War was, perhaps, his peculiar province, but his other attributes were shared by other gods and by the ancestors; at best he ranked as primus inter pares. It has, indeed, been suggested that he was himself but a deified ancestor, the progenitor of all the Shang kings, or that he embodies all the royal ancestry; that is possible, but the argument adduced in support of the theory, namely the fact that certain of the Shang kings bear such names as Ti I and Ti Hsin, could just as well be urged against it, seeing that theophoric names, i.e. names compounded with the name of the god, of the sort common in Sumer and in other lands of the ancient Middle East, imply the recognition of an already existing deity. Both the gods and the ancestors existed; they had knowledge and they had power, power for good and for evil. The purpose of religion was therefore twofold: to secure by offerings the favour of the gods, so that they might grant to the suppliant not evil but good, and to wrest from the gods the knowledge that would guide his actions in this world. The sacrifices have been described; the knowledge was to be gained by divination. One method of divination was, probably, by mediums, in Shang as in later days, but naturally no material evidence for that remains. The other method, for which we have evidence in plenty, was the interpretation of the cracks produced by heat in tortoise-shell or in bone. Of the two materials the former seems to have been the original and the most efficacious, for there were frequent references to consulting ‘the tortoise’, of ‘the Great Tortoise’, whereas bone is never mentioned as such. When, in 1395 BC, P’an Keng shifted his capital to Anyang he reminded his discontented subjects, ‘You did not presumptuously oppose the decision of the Tortoise’. The questions are severely practical. Some deal with sacrifice, to whom it should be made—it was, of course, essential to find out which deity had to be propitiated—and when, and with what kind of offerings. A very common subject is war; the king enquires of the oracle when to declare war, how many men to engage, whether to attack or remain on the defensive, and what prospects there were of booty and prisoners? The crops–the outlook for each kind of grain and for the output of liquor; the weather, not only the general forecast but the immediate–‘Will it rain tonight?’ (and in a few cases we are given not only the official answer ‘No’ but the comment ‘It really didn’t rain!’); illness—will the patient recover? ; dreams—does such and such a dream portend good or evil? ; and the astrologer’s usual gambit, ‘Will next week be lucky or unlucky?’; and finally, and very often, ‘Will the Powers help?’ ‘Shall I receive aid?’ ‘Will the spirit of Grandfather aid the king?’ Such is the information that man in ancient China desired to obtain from the spirit world, and to obtain it was the whole purpose of religion. In some remote regions the most archaic form of community is to be found, of which ancient authors make such frequent mention. The land is cultivated in common, and the produce divided among all the inhabitants. At the present time, however, collectivity no longer exists generally, except on the joint-family. This family community still exists almost everywhere, with the same features as the zadruga of the Southern Slavs. Each family is governed by a patriarch, exercising despotic authority. The village is administered by a chief, sometimes elected, sometimes hereditary. In the villages where the ancient customs have been maintained, the authority belongs to a council, which is regarded as representing the inhabitants. The most necessary trades, such as those of the smith, the currier, the shoemaker, the functions of the priest and the accountant, devolve hereditarily in certain families, who have a portion of the land allotted to them by way of fee…In England, there are numerous traces to show that a custom formerly existed there exactly similar to that practised in India, a remarkable instance of the persistence of certain institutions in spite of time and national migrations. This intimate association which forms the Hindu village rests even at the present day on family sentiment; for the tradition, or at least the idea, prevails among the inhabitants of descent from a common ancestor: hence arises the very general prohibition against land being sold to a stranger. Although private property is now recognized, the village, in its corporate capacity, still retains a sort of eminent domain. Testamentary disposition was not in use among the Hindus any more than among the Germans or the Celts. In a system of community there was no place for succession or for legacies. When, in later times, individual property was introduced, the transmission of property was regulated by custom. As Sir H. Maine remarks, in the natural association of the primitive village, economical and juridical relations are much simpler than in the social condition, of which a picture has been preserved to us in the old Roman law and the law of the Twelve Tables Land is neither sold, leased, nor devised. Contracts are almost entirely unknown. The loan of money for interest has not been thought of. Commodities only are the subject of ordinary transaction, and in these the great economic law of supply and demand has little room for action. Competition is unknown, and prices are determined by custom. The rule, universal with us, of selling in the dearest market possible and buying in the cheapest, cannot even be understood. Every village and almost every family is self-sufficient. Produce hardly takes the form of merchandise destined for exchange, except when sent to the sovereign as taxes or rent. Human existence almost resembles that of the vegetable world, it is so simple and regular. In the dessa of Java, and in the Russian mir, we can grasp, in living form, civilization in its earliest stage, when the agricultural system takes the place of the nomadic and pastoral system. The Hindu village has already abandoned community, but it still retains numerous traces of it. In its relations with the state, the village is regarded as a jointly responsible corporation. The state looks to this corporation for the assessment and levying of imposts, and not to the individual contributor…The village owns the forest and uncultivated land, as undivided property, in which all the inhabitants have a right of enjoyment. As a rule, the arable land is no longer common property, as in Java or in Germany in the days of Tacitus. The lots belong to the families in private ownership, but they have to be cultivated according to certain traditional rules which are binding on all. It appears that cultures like Bali, Java, India, China and the Graeco-Roman world had two distinct religions. The older one was the veneration of one’s ancestors centered around the domestic temple or hearth, and based on the ongoing maintenance of the relationship with the dead–the ceremonial offerings; the funerary repasts; the sacrificial rites; burial practices; and so on. The other was a broader public worship based in temples and mediated by a professional class of priests, of a pantheon of Major Deities connected to nature or the stars. It was this latter worship, de Coulanges attests, that allowed the ancient city-states to form. We are correct, therefore, in saying that this second religion was at first in unison with the social condition of men. It was cradled in each family, and remained long bounded by this narrow horizon. But it lent itself more easily than the worship of the dead to the future progress of human association. Indeed, the ancestors, heroes, and manes were gods who by their very nature could be adored only by a very small number of men, and who thus established a perpetual and impassable line of demarcation between families. The religion of the gods of nature was more comprehensive. No rigorous laws opposed the propagation of the worship of any of these gods. There was nothing in their nature that required them to be adored by one family only, and to repel the stranger. 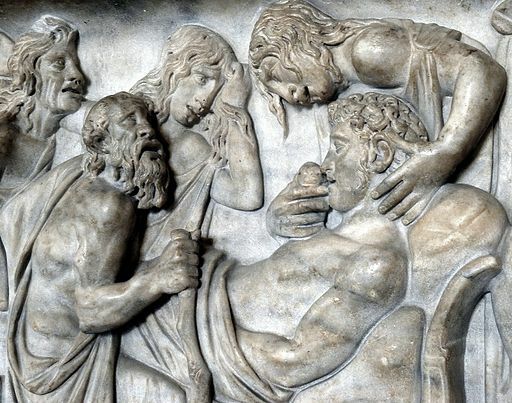 Finally, men must have come insensibly to perceive that the Jupiter of one family was really the same being or the same conception as the Jupiter of another, which they would never believe of two Lares, two ancestors, or two sacred fires. Let us add, that the morality of this new religion was different. It was not confined to teaching men family duties. Jupiter was the god of hospitality; in his name came strangers, suppliants, “the venerable poor,” those who were to be treated “as brothers.” All these gods often assumed the human form, and appeared among mortals; sometimes, indeed, to assist in their struggles and to take part in their combats; often, also, to enjoin concord, and to teach them to help each other. As this second religion continued to develop, society must have enlarged. Now, it is quite evident that this religion, feeble at first, afterwards assumed large proportions. In the beginning it was, so to speak, sheltered under the protection of its elder sister, near the domestic hearth. There the god had obtained a small place, a narrow cella, near and opposite to the venerated altar, in order that a little of the respect which men had for the sacred fire might be shared by him. Little by little, the god, gaining more authority over the soul, renounced this sort of guardianship, and left the domestic hearth. He had a dwelling of his own, and his own sacrifices. This dwelling (ναος, from virago, to inhabit) was, moreover, built after the fashion of the ancient sanctuary; it was, as before, a cella opposite the hearth; but the cella was enlarged and embellished, and became a temple. The holy fire remained at the entrance of the god’s house, but appeared very small by the side of this house. What had at first been the principal, had now become only an accessory. It ceased to be a god, and descended to the rank of the god’s altar, an instrument for the sacrifice. Its office was to burn the flesh of the victim, and to carry the offering with men’s prayers to the majestic divinity whose statue resided in the temple. …For a country, state, or city to run properly, the government creates various departments and employs individuals within those departments — teachers, postal workers, police and military personnel, construction works, doctors, politicians, and so many more. Each of these departments employs hundreds or thousands of individuals carrying out their respective duties and each sector has an individual or multiple individuals that oversees the activities of that one unit. Each head of an area is endowed with certain privileges and powers which facilitates them in their tasks. It’s safe to say that the number of individuals working for the United States government goes into the millions. This is just to keep one country working. Multiply that by all the countries on the planet, which is around 200, and all the people working for these governments, the total would easily come out to tens of millions of people employed by the various governments of the world to run one planet. The way it’s explained is that in order to keep the universe running, Krishna, the supreme being, has put into place individuals that oversee different parts of the material universe. These individuals are powerful beings that have been appointed by Krishna and have been bestowed with the necessary powers and abilities to manage and govern their area of creation. They can be referred to as demigods. For example, there is someone responsible for the sun and his name is Surya. The goddess Saraswati is the overseer of knowledge. The creator of the material universe is known as Brahma. The destruction of the universe is overseen by Shiva and Vishnu serves as the maintainer. There are individuals overseeing the oceans, the wind, and practically every facet of creations. When seen from this perspective, 33 million is not that big a number. Because the pantheon of gods was not associated with a specific family, unlike the ancestral deities or protector spirits, worship was open to all. This allowed larger associations to form. de Coulanges goes on to describe how each city had its own patron god or goddess who watched over and protected their city. In this way, they were quite similar to Babylonian cities, which were also based around the worship of a particular tutelary deity (Marduk with Babylon, Ashur with Assur, Enlil with Nippur, Ishtar with Arbela, etc.). The relationship of the citizens of the polis was the same as that of the corporate family writ large. The sacred worship of the ancestors was transferred to the city’s patron god/goddess. The demos was a kind of congregation, united in worship. It is only in this context that the institution of the ancient city can be fundamentally understood, argued de Coulanges. Thus the city was not an assemblage of individuals; it was a confederation of several groups, which were established before it, and which it permitted to remain. We see, in the Athenian orators, that every Athenian formed a portion of four distinct societies at the same time; he was a member of of a family, of a phratry, or a tribe, and of a city. He did not enter at the same time and the same day into all these four, like a Frenchman, who at the moment of this birth belongs at once to a family, a commune, a department, and a country. The phratry and the tribe are not administrative divisions. A man enters at different times into these four societies, and ascends, so to speak, from one to the other. First, the child is admitted into the family be the religious ceremony, which takes place six days after his birth. Some years later he enters the phratry by a new ceremony, which we have already described. Finally, at the age of sixteen or eighteen, he is presented for admission into the city. It was this worship mediated by priests and based in temples that allowed for greater levels of social complexity than tribal groupings. Everywhere where an organized, professional bureaucratic priesthood emerged we see a scaling up of social complexity and the emergence of permanent status hierarchies. Certain families are ranked higher than others, either by an ability to mediate with transcendent deities or through descent from a particularly prestigious ancestor. Often the head of this lineage becomes the first de facto ruler. And there is always a connection between the priesthood and the political ruing class. Sometimes they are one in the same, as in a theocracy. Other times they are ideological allies, with the secular authority in the driver’s seat (called Caesaropapism). Since the priests are mediators between men and the gods, their services are essential—not to mention expensive. We’ve previously shown that the donations to the priestly class (as described in Leviticus, for example), were the origin of taxation. And the need to assess these donations against one another was the impetus for the development of money, originating as a system of measurement. Thus, primitive general-purpose money was always and everywhere associated with priests, kings, and temples. Tribal societies practised magic in which the community exercised a collective relationship with their deceased ancestors who were believed to inhabit a spirit world that was part of nature. The deceased were to continue to fulfill their social obligations by communicating tribal commands to those forces of nature which could not be understood by per-scientific populations. Totemism differs from mature religion in that no prayers are used, only commands. The worshipers impose their will on the totem by the compelling force of magic, and this principle of collective compulsion corresponds to a state of society in which the community is supreme over each and all of its members … the more advanced forms of worship, characteristic of what we call religion, presupposed surplus production, which makes it possible for the few to live off the labour of the many. The king had been chosen and approved by the gods and after his death he retired into their company. Contact with the gods, achieved through ritual, was his prerogative, although for practical purposes the more mundane elements were delegated to priests. For the people of Egypt, their king was a guarantor of the continued orderly running of their world: the regular change of seasons, the return of the annual inundation of the Nile, and the predictable movements of the heavenly bodies, but also safety from the threatening force of nature as well as enemies outside Egypt’s borders. Signifying the new state of affairs was the temple which was not only ‘…an architectural expression of royal power, it was for them a model of the cosmos in miniature’. And, while the pharaohs were careful not to supplant the clan (magic) cults with the new centralized religion (until the ill-fated experiment of Akhetaten, that is), the pharaoh became ‘…theoretically, the chief priest of every cult in the land’. Essentially, the spirit world was converted to one of gods, and the control of nature, previously seen as a generally sympathetic force, was now in the hands of priests. Nature itself became hostile and its forces, controlled by gods, required pacification through offerings. The king–the “one true priest”–and the priests placed themselves as the central unifying force around which continued economic success depended. In so doing, they could maintain the flow of resources that provided their enormously high levels of conspicuous consumption and wasteful expenditures that certified their status as envoys to the natural world. To understand … primitive religion in general, …we have to note that he held that early religions lacked creeds and dogmas: ‘they consisted entirely of institutions and practices.’ Rites, it is true, were connected with myths, but myths do not, for us, explain rites; rather the rites explain the myths. If this is so, then we must seek for an understanding of primitive religion in its ritual, and, since the basic rite in ancient religion is that of sacrifice, we must seek for it in the sacrificium; and further, since sacrifice is so general an institution, we must look for its origin in general causes. Fundamentally, Fustel de Coulanges and Robertson Smith were putting forward what might be called a structural theory of the genesis of religion, that it arises out of the very nature of primitive society. This was also Durkheim’s approach, and he proposed to show in addition manner in which religion was generated. The position of Durkheim…can only be appraised if two points are kept in mind. The first is that for him religion is a social, that is an objective, fact. For theories which tried to explain it in terms of individual psychology he expressed contempt. How, he asked, if religion originated in a mere mistake, an illusion, a kind of hallucination, could it have been so universal and so enduring, and how could a vain fantasy have produced law, science, and morals? And that is exactly the fundamental question I have. Why religion? I think David Fleming does a good job of describing why in Lean Logic. His take is about the need to destroy excess capital, which we avoid today at our own risk. Kinda like my pet peeve of people thinking survival of the fittest means some super efficient organism living on a knife’s edge. There must be excess and then the question becomes what an organism does to disappate excess energies. For humans that involves religions, traditions, and festivals for any and every occasion. The problem with that is the fact that even societies that have little to no surplus still have beliefs in supernatural entities. For example, I’m preparing a post on the spiritual beliefs of the Pirahã of the Amazon rain forest. They are immediate-return hunter-gatherers who do not cultivate surpluses. Besides, if you wanted to get rid of excess stuff, you could just hold a big ol’ bonfire without any of the supernatural mumbo-jumbo. And then Judaism comes along and rejects ALL the ancient gods. They are all the product of idolatry, the very human tendency to create something and then forget it’s our own creation. But Judaism retains the idea that there is a God, utterly beyond us, because there is patently something left after all our own creations have been disposed of. And then Christianity comes along and takes the idea of sacrifice to a whole new level. great work again. also great to see the commentary here. this site has always had the potential for enormous serious discussion of fundamental questions. hope this is a start, and encouragement for you to continue. Oh, certainly. I would love that!